BLOOMFIELD, Conn.--(BUSINESS WIRE)-- A study by global health service company CIGNA Corporation (NYSE: CI) shows that individuals whose medical, behavioral and pharmacy health benefits are connected and administered by Cigna are more engaged in their health and well-being than those whose benefits are not fully integrated across medical, behavioral and pharmacy. As a result, people experience improved health and employers experience cost savings. Employers see an average medical savings of $193 annually for each covered person and $645 annually for each person with a known health improvement opportunity. 22 percent more people engage in health coaching and case management programs. Employers see annual medical cost savings of $9,792 for engaged customers with a specialty condition, such as multiple sclerosis or rheumatoid arthritis. When people being treated for diabetes are engaged, the savings is $5,900. 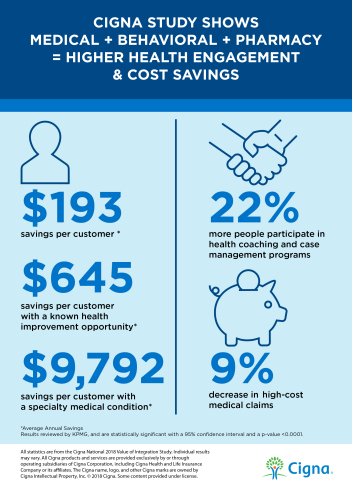 A 9 percent reduction in high cost medical claims for customers with integrated benefits. Customers with integrated benefits had a 10 percent reduction in out of network claims. Cigna conducts the Value of Integration Study annually to assess and evaluate opportunities to optimize health plan benefit designs. Cigna's 2018 Value of Integration Study examined approximately 4.9 million customer claims nationally from January 2016 to December 2017 from medical claims for group benefit plans. Approximately half of the population had comprehensive medical, behavioral and pharmacy benefits administered by Cigna while the other half had only medical benefits with standard behavioral benefits administered by Cigna. Customers were matched between the two groups on key attributes, including demographics, health condition, access to health improvement services, plan design and geographies. Individual customer/client results may vary. KPMG LLP was engaged by Cigna to perform a review of Cigna’s analysis of medical cost savings benefits from integration. While KPMG did not validate the Cigna 2018 Pharmacy Integration Study, KPMG reviewed the approach and methods used to conduct the study of medical cost savings benefits and found them to be sound. Cigna used a published academic method and appropriate statistical tests. KPMG did not conduct an independent analysis to verify any results. KPMG did not audit the data or the programming code used to conduct the study. The data used for the Cigna study was Cigna’s own internal data. Cigna Corporation (NYSE: CI) is a global health service company dedicated to helping people improve their health, well-being and sense of security. All products and services are provided exclusively by or through operating subsidiaries of Cigna Corporation, including Connecticut General Life Insurance Company, Cigna Health and Life Insurance Company, Life Insurance Company of North America and Cigna Life Insurance Company of New York. Such products and services include an integrated suite of health services, such as medical, dental, behavioral health, pharmacy, vision, supplemental benefits, and other related products including group life, accident and disability insurance. Cigna maintains sales capability in over 30 countries and jurisdictions, and has more than 95 million customer relationships throughout the world. To learn more about Cigna®, including links to follow us on Facebook or Twitter, visit www.cigna.com. For more information about Cigna's proposed acquisition of Express Scripts, please visit www.advancinghealthcare.com.